It’s that time of year in Kenya again – the “short rains” are coming, there’s a slight chill in the air, and every now and then, the sky opens up for a brief deluge of water. It’s hard to avoid getting wet during the rainy season here, something we’ve designed the BRCK to handle (in small doses, at least). It just so happens that one of our key partners, Hackers for Charity – who help schools and nonprofits solve technology related problems so they can get on with their jobs – has some interesting problems they are trying to solve in their work with schools around Jinja, Uganda, at the source of the White Nile and on the shores of the largest body of water in Africa, Lake Victoria. Time for a water-bound expedition, methinks. This year, we’re taking a slightly different tack. When we started making the BRCK, we found some of the greatest need for affordable, reliable connectivity is in schools. We’ve been pushing hard for solutions in the edtech scene ever since, working with partners such as eLimu, Mozilla, and Sugata Mitra’s “School in the Cloud” TED prize wish to develop projects around innovative caching solutions to cut down the costs for data, a Raspberry Pi MRTR to turn your BRCK into a remote server, and testing connectivity solutions in schools from India to Ghana. 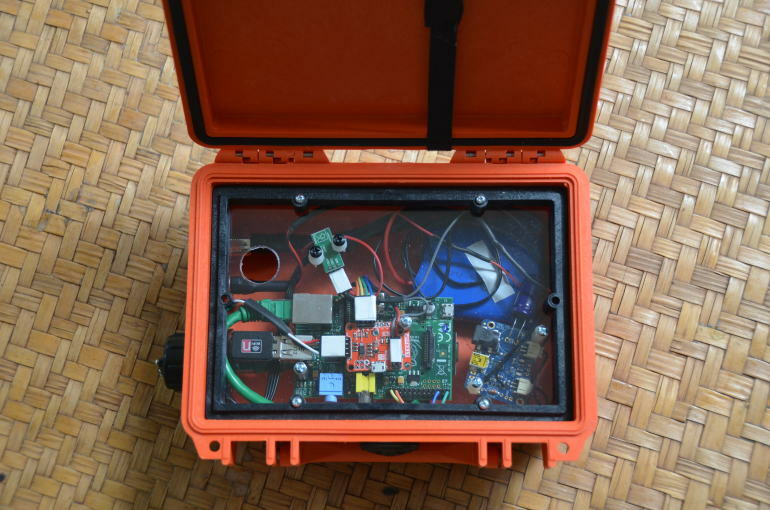 When Johnny Long, the founder of Hackers for Charity, first contacted BRCK back in June, he showed us his own attempts to build a rugged and reliable remote connectivity device. It looked remarkably like some early BRCK prototypes. It was clear we were trying to solve the same problems, and that by working together we could make a dent in the challenges facing students in rural Uganda. We set Johnny up with a BRCK and gave him free reign to hack it however he needed to build the solutions that worked for the schools he and Hackers for Charity supports. At last, we have the chance to work with him directly. On Sunday, six of us will load up the Land Rover and make the 12-hour journey from Nairobi to Jinja. Johnny has graciously offered to host us at the bed and breakfast he and his wife run while we set about training up the Hackers for Charity staff on the technical aspects of the BRCK, testing antennas and signal amplifiers, and ultimately working to get several local schools online. As if this wasn’t enough, Jinja also happens to be at the headwaters of the White Nile, with some of the best high-volume whitewater in the world. A BRCK expedition can’t be all bed and breakfasts, so we looked up Pete Meredith, one of the leading explorers of the Nile (he’s ran it from the furthest source in Rwanda all the way to the Mediterranean), and Nalubale Rafting to help us spend a couple days exploring the river. Both of these projects have very kindly shared info about their open-source sensor package designs with us. We’ve put together our own package to test pH and water temperature, and will attempt to stream data from the river as we go. This will be a fantastic learning experience as we further develop IoT use cases for the BRCK, and we hope will prove a valuable source of insights for how we can better enable our conservation partners to inform the wider public about the amazing work they’re doing, and the importance of these fragile ecosystems. So, with a very full docket, our soldering irons packed, and our heads and hearts full of excitement, the BRCK team is once again setting out into the wild blue yonder. Get ready to follow along – BRCK Expedition 2014 begins tomorrow!